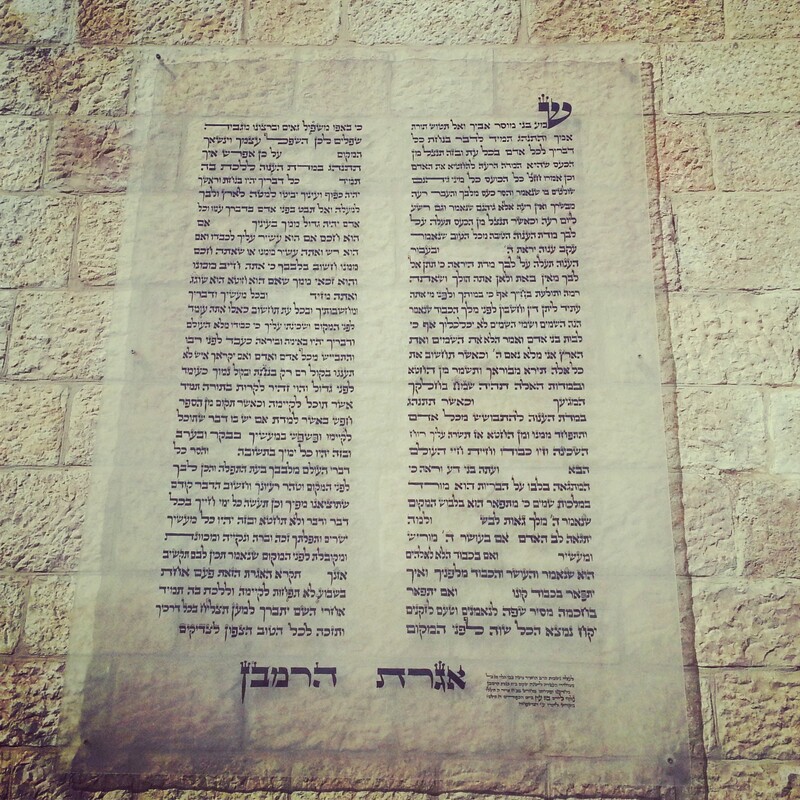 We have visited sites in the Jewish Quarter before, as part of our tours of Jerusalem in the First Temple Period, the Second Temple Period, even the Crusader Period. Today, however, was focused on the more recent history of the quarter, from when Jews returned to live in the area in around 1400 after being expelled from the area surrounding Mt Zion. Historically, Jewish communities have been centred around synagogues, and these formed a large part of our morning tour. We began at the Ramban Synagogue where we learned about the great Torah scholar and thinker, Rabbi Moshe ben Nachman after whom it is named. 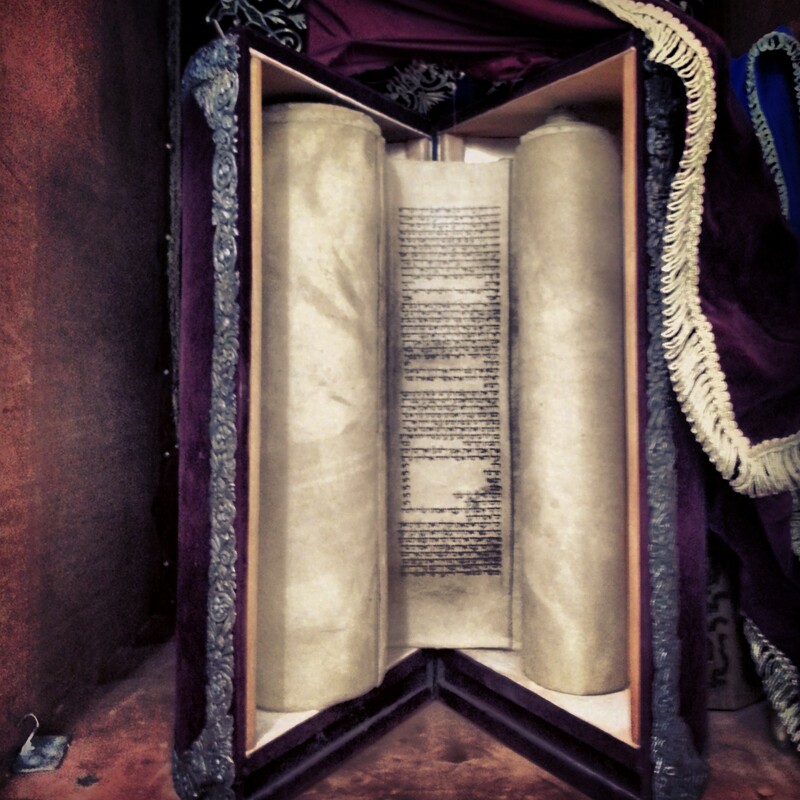 Arriving in Jerusalem in the 13th century, shortly after it had been devastated by Mongol marauders, he helped re-establish the Jewish community here and we heard from letters he wrote on the subject. 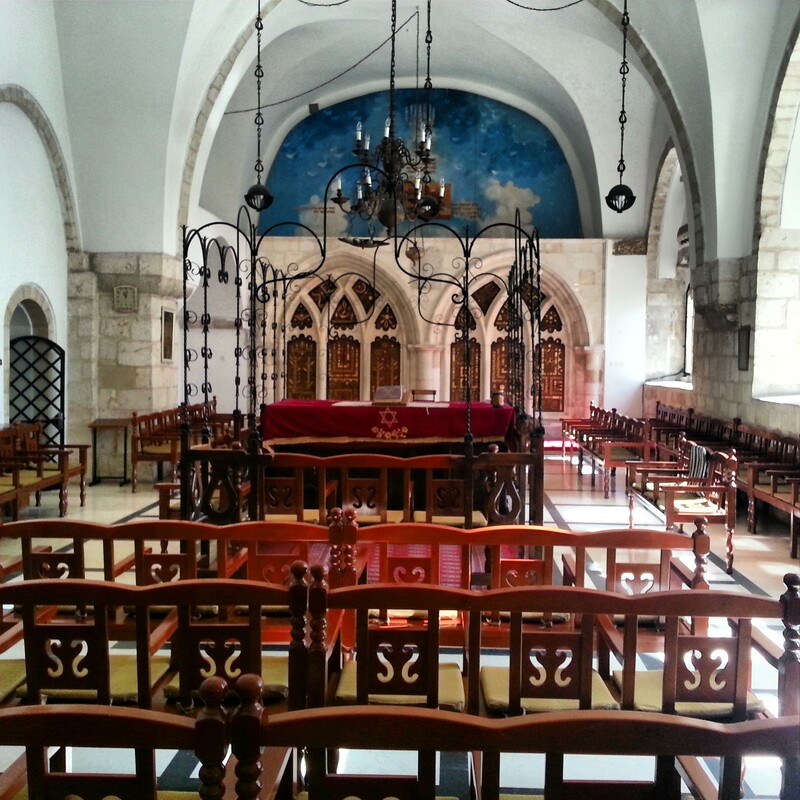 It is probably the oldest synagogue in continuous use in Jerusalem. The other contender for that crown is the Synagogue of Rabbi Yochanan ben Zakai, located in the complex known as the ‘Four Sephardi Synagogues’. Originally all separate structures, they were united into one in the mid 19th century, when an Egyptian invasion relaxed many of the restrictions imposed by the Ottomans on Jewish building. Also in the complex are the Central, Istanbul and Elijah the Prophet synagogues. From 1948-67, when the Jewish Quarter was under Jordanian control, these buildings were used as storehouses, warehouses, and fell into disrepair. 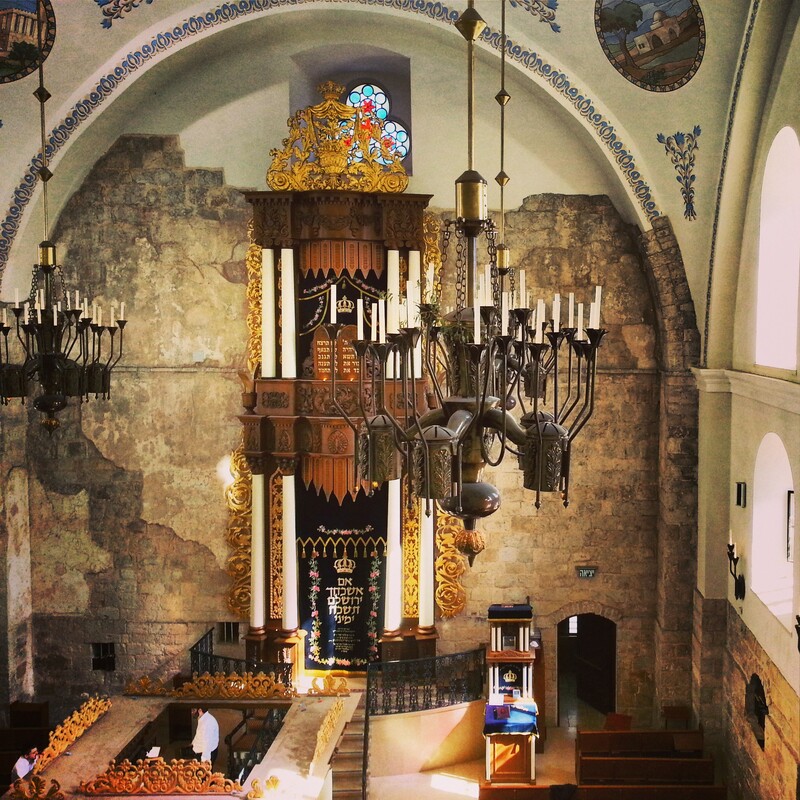 They have now been restored and are impressive structures; they remain in regular use by the local and visiting Sephardi communities as their main hub in Jerusalem. We continued to the ruins of the Tiferet Yisrael synagogue, which is currently being restored. As one of the tallest buildings in the Jewish Quarter, it is quickly blown up by the Jordanian army as they advanced in 1948, to prevent any potential height advantage for Israeli fighters. It should be open in a few years for visitors to marvel at its renewed glory. Opposite Tiferet Yisrael was the small Karaite Centre of Jerusalem. We descended underground to visit their synagogue which they believe has been at that site since the 9th century. The Karaites are an interesting group of Jews who follow only the Bible and not the following commentaries or exegesis in the Oral Law. 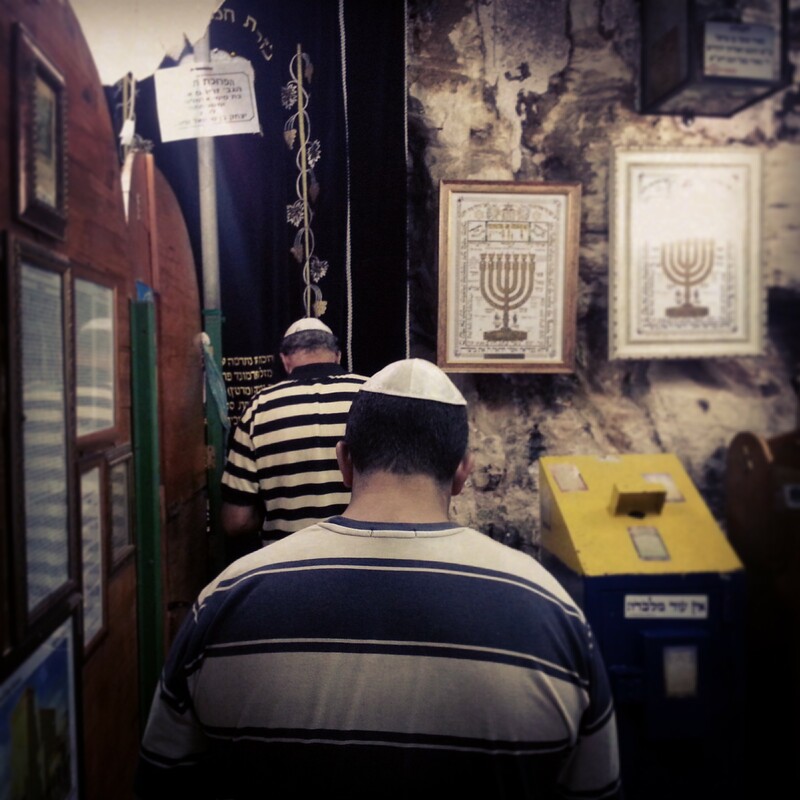 They are now few in number and the Jerusalem synagogue only functions as a place for prayer on special request; the majority of the community is currently based in Ramla (avid blog followers will recall that we paid them a visit a few months ago). Our final synagogue visit was also to the most magnificent of those in the Jewish Quarter, the ‘Hurva’. Originally built by Ashkenazi Jews arriving from Europe in the 1700s, it was destroyed when they could not pay the large loans taken to fund the construction; in fact this led to the formal expulsion of all Ashkenazi Jews from Jerusalem (although several found ingenious ways of sticking around). Rebuilt around 100 years later, it was again destroyed in 1948, this time by the Jordanians who as with Tiferet Yisrael decided to destroy the large buildings in the area. It was eventually rebuilt and restored at great expense, reopening just a few years ago in 2007. Its interior is quite stunning as are the views possible from the dome’s exterior balcony. After some respite for refreshments we paid a quick visit to the site of Jerusalem’s first hospital (you can’t enter it anymore but we saw the building) and then popped into the very interesting Old Yishuv Courtyard museum. This small but carefully maintained museum tells the story of the life of the inhabitants of the Jewish Quarter under Ottoman and British rule with artefacts from their lives and rooms mocked up in traditional styles. After a brief stop at a stunning viewpoint over the Temple Mount and the Western Wall, we concluded the day at the memorial for those who fell in the battle for the Jewish Quarter in the 1948 War of Independence. As the area was at the time under siege, it was impossible to bury the dead in the tradition location of the Mount of Olives cemetery; therefore special dispensation was given to bury them in a mass grave, which is now the memorial. After Israel took back the area in 1967, they moved the bones to the Mount of Olives. We heard here about the heroic struggle to survive and hold the Jewish Quarter in the war, which ultimately failed in the face of superior numbers and experience on the part of the Jordanian army. Although a huge dent in morale, the loss of this area made the reunification of Jerusalem in 1967 that much more euphoric. Today’s trip was dedicated to Haifa, the third largest city in Israel and the largest city in the North of the country. Located on the Carmel Mountain, where its steep slopes meet the sea, it was a tiny settlement eclipsed by its northern neighbour Acre (Akko) until the British decided built a major port in the 1920s; it is now the largest port in Israel and an important gateway into the Mediterranean. Celebrating our 40th field trip: half way through! The day began with a small celebration; this was our 40th field trip out of 80 on the course; our half-way point. 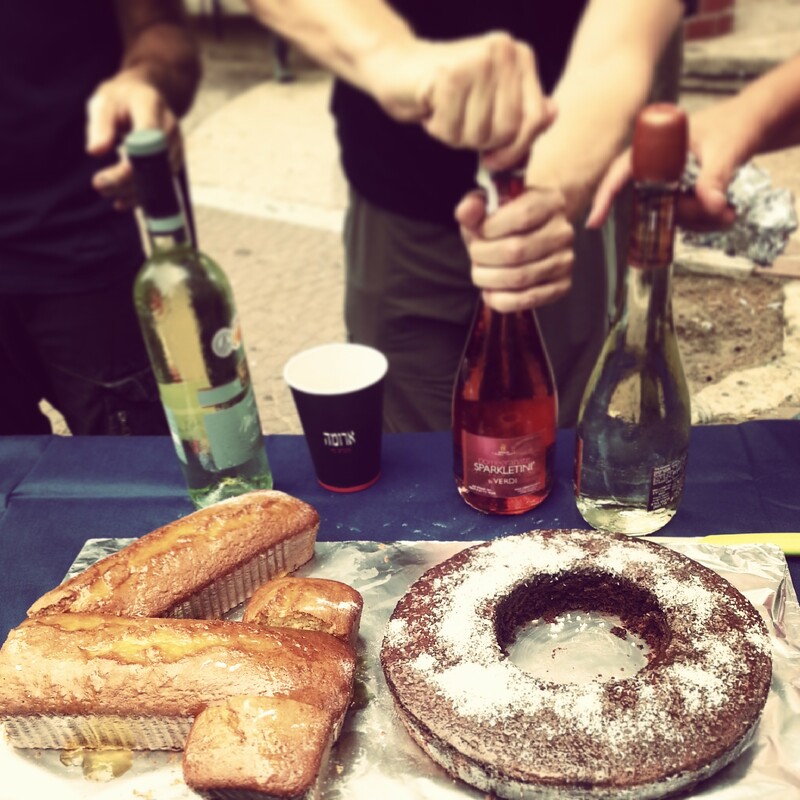 One of our class put a lot of effort into making a cake to celebrate which was served with wine for a l’chaim, putting everyone in a good mood at 8am in the morning! After enjoying a look out over the city from the Louis Promenade high up atop the Carmel mountain, we visited the city’s main attraction, the Bahai Gardens. These beautifully designed and maintained gardens dominate the hillside from a distance; consisting of several terraces and a large shrine in the centre. Inside the shrine are buried two of the most important figures in the Bahai faith, the Bab and the Abdul Baha. As we descended through the immaculately tended gardens we learned about the Bahai religion; its establishment in Iran and the persecution which led to its relocation in Israel. 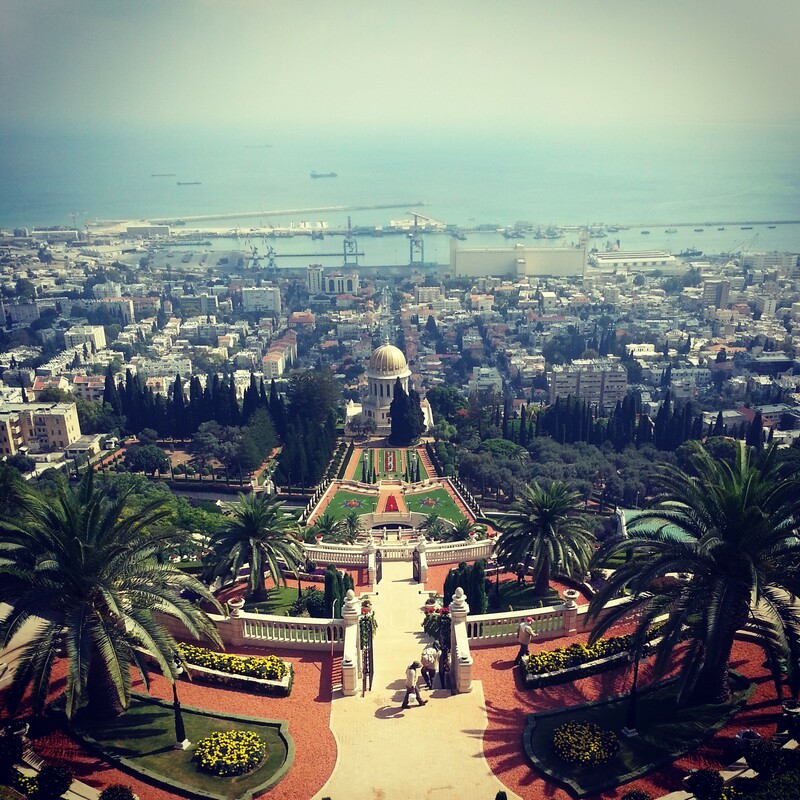 Adherents of the faith are now spread out across the world but these gardens in Haifa are the main holy site together with another location in Acre. Sculpted gardens are a very unusual site in Israel and also contrast starkly with the industrialised scenery of the port – it is a beautiful area of serenity within the hustle and bustle of a busy city. Having descended to the shrine, we left the area of the gardens and drove further up the mountain to the Centre for Ahmadiyya Islam in Israel. 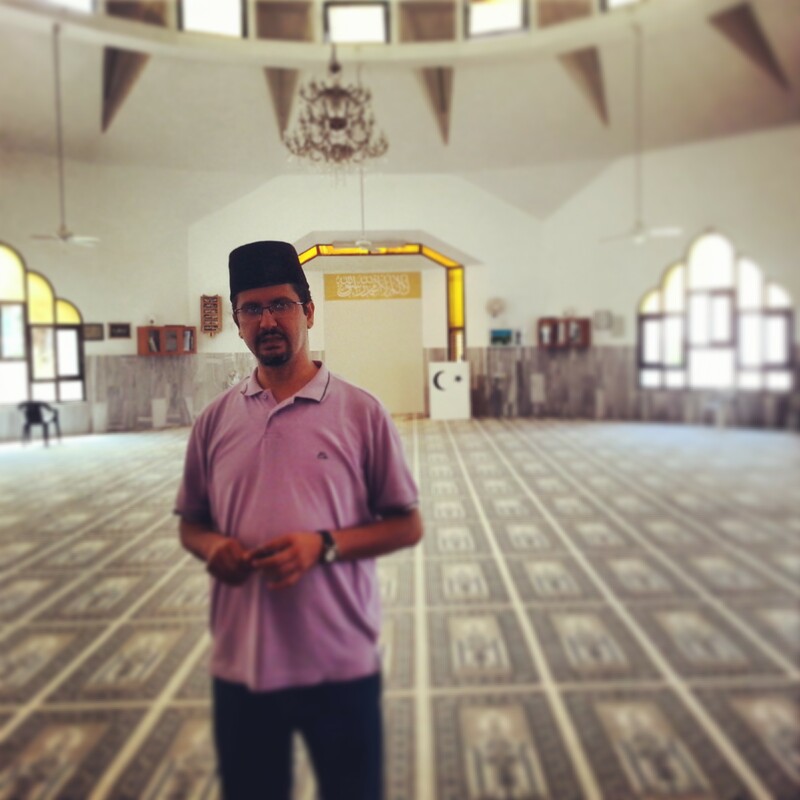 We visited the mosque and learned about this minority Muslim group, adherents of which were brought from India to Israel by the British to help construct the port. Their leader’s message of peaceful coexistence was well received although we were saddened to learn that they are persecuted within the Muslim world to the extent that going on the Haj (the pilgrimage to Mecca which every observant Muslim man should do once in his lifetime) is actually often too dangerous to attempt. 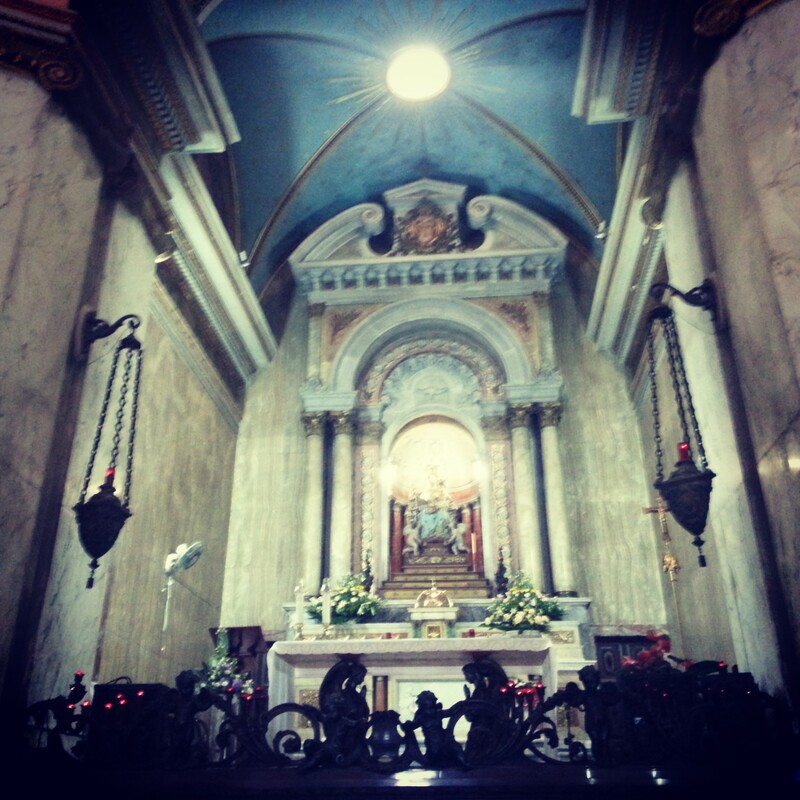 Continuing the theme of different religions, our next stop was at the Stella Maris church, belonging to the Carmelite Order, a group of monks and nuns who since Crusader times have been connected to the Carmel Mountain. Inside the church is a cave believed to have been frequented by the prophet Elijah; there is also a small display of artefacts excavated on Carmelite land on the Carmel. Outside the church, our guide discussed the history of the sanctity of the Carmel, which seems to go back to an association with Helios, the sun god of the Greeks and Romans, from the second century BCE. Helios has a close association with Elijah (the name; the fact that they both ride in fiery chariots) and it seems that Elijah’s association with the Carmel may have been inherited from Helios as a result. We also learned about Napoleon’s campaign in the 18th century, which passed through the area of modern day Haifa, and indeed the church was used as a hospital for his wounded following defeat at Acre. 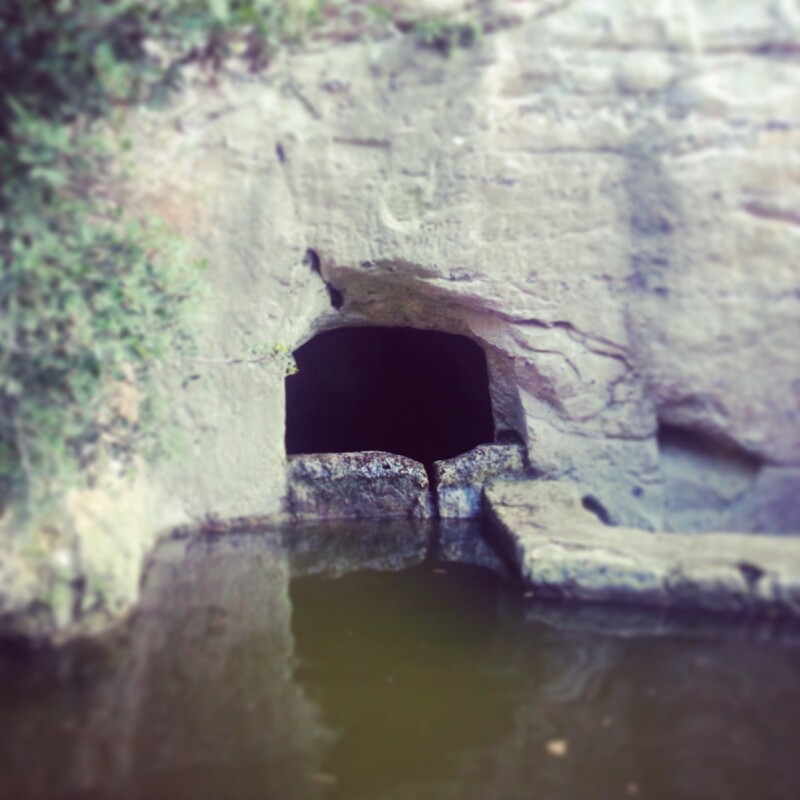 We hiked a short trail down the hill to arrive at the Cave of the prophet Elijah. 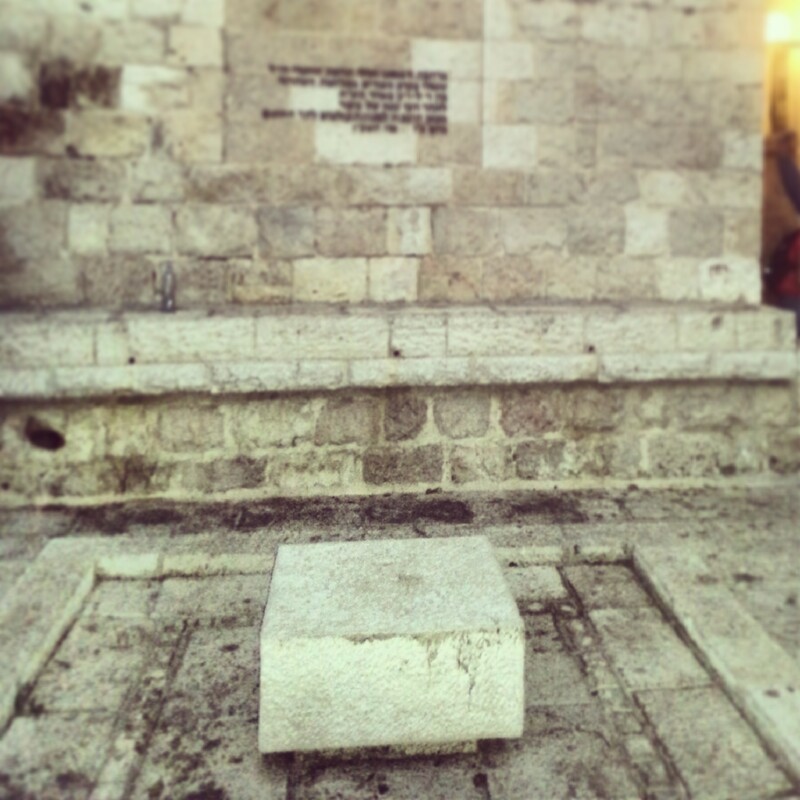 A holy site for Jews, Christians, Muslims and Druze (as opposed to the Stella Maris, which is holy for Christians), it is believed that Elijah spent time praying here before challenging the prophets of Baal (referred to in 1 Kings 18) at the Mukhraka. We discussed the life of Elijah, a (literally) fiery character, and noted the ancient pilgrim graffiti inside the cave. After a spot of lunch we turned to the topic of modern Haifa and had a walking tour in the area of the German Colony. Founded in 1868 by a group called the Templers, consisting of German Christians, it largely consists of a beautiful wide avenue straddled by buildings that were clearly not built by local architects. 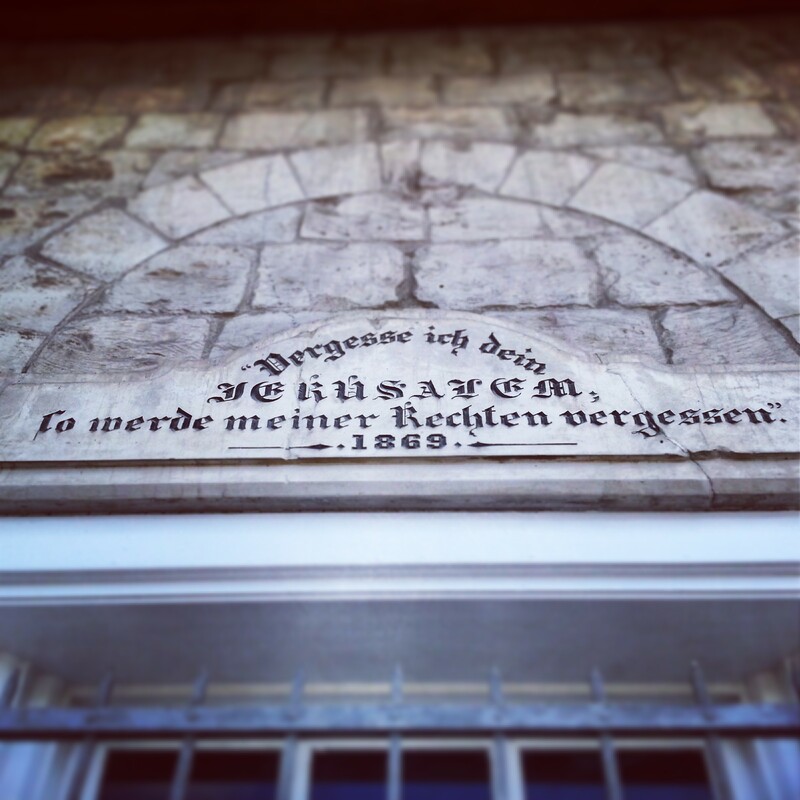 All the buildings have a biblical quotation above the doorway, and the German member of our class kindly obliged with translations! We learned about the history of the Temple Society, some of the key figures, and its influence on the technological innovation in Israel, particularly with regard to the early Zionist pioneers. We concluded the day in Nachal (or Wadi) Siach, a small valley that lies between two spurs of the Carmel Mountain on which the city is built. After a steep climb we were able to see the remains of a British Mandate period bathhouse and garden, based on channeling the springs further up the slope. As we continued further we found the remains of a Crusader church, believed to be the one in which the Carmelite order was founded. The area is currently not in a very good state but apparently the municipality has plans to refurbish and develop the area which could make it a very pleasant stop on future Haifa tours. Still, it does not stop the locals from coming here to cool off in the springs and pools during the hot months of the summer. A day of multiple religions, modern and ancient history, and even a little hiking. Next week we will travel slightly further north to the ancient port city which Haifa usurped in importance: Akko (Acre).